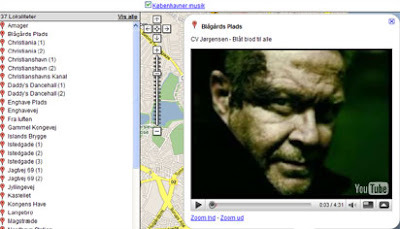 Soren Johannessen has created a Google Maps mash-up of YouTube videos that contain songs about Copenhagen, Denmark. So far Soren has mapped 36 songs but hopes that users will add more. You can suggest other songs about Copenhagen on Soren's blog Microformats.dk. Soren has also started a music map for all of Denmark, which hasn't got many songs yet but which he plans to add more to. Both maps were built using Map Channels new Feed Maps API and Google Spreadsheets.